Well, after getting Ernieplex finished I got The Drawing Board out of its cubbyhole and back in its rightful place, intending to get on with it. However, things proceeded very slowly for a while - so slowly that I've been having a blitz on it over the last couple of weeks. The results follow. The 3 tippers on the tipping dock - a study in rust. Yes, I finally got round to painting them. The tipping device in action. Rather than try to hide it I've painted it red and white, as part of the scene. It only took a couple of attempts to get the form right and a little adjustment is easy to make. Now I need the tipping chute below - and a way to get the skips back to the horizontal. Didi and Wot the Deutz making their way out of the scene past the Wood Bros building. Woody and Ernieplex on the curve with the other 2 wagons. The atmosphere must be very corrosive. A study in calm repose by the Wood Bros door. Very atmospheric - and VERY convincing. You say there's lots to do - but there's already a LOT to look at and admire. I'm not going to list it all here as actually...........I'm still admiring!! it looks great.love the solution with the tipping of the skips. You could use a similar contraption to bump them back down. Bilco wrote: It only took a couple of attempts to get the form right and a little adjustment is easy to make. Now I need the tipping chute below - and a way to get the skips back to the horizontal. I agree with what the other have said! 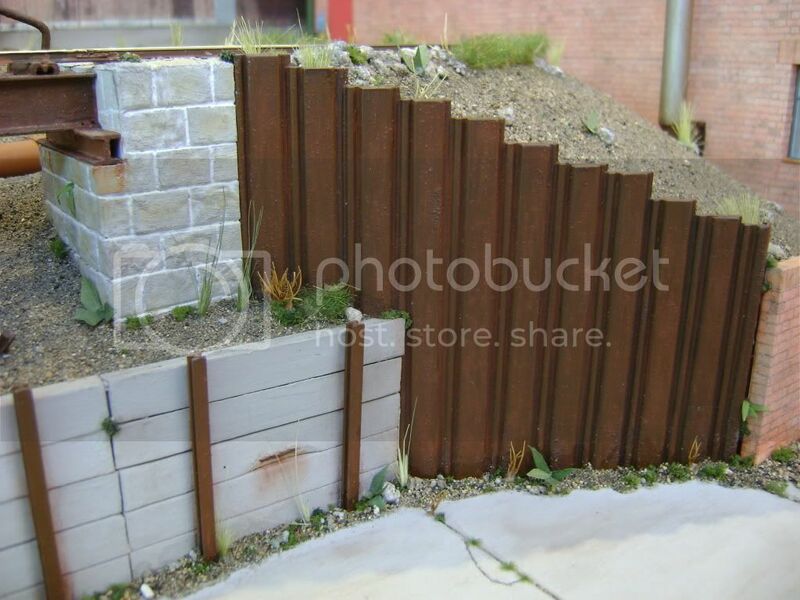 This is a fantastic small layout, and I love the rust effects. 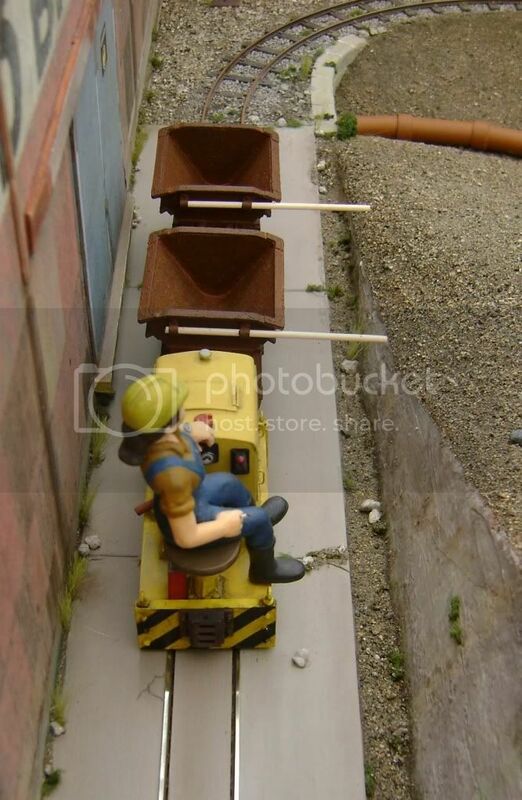 Re: getting you tippers back to horizontal, you could drive backwards with them in the tipped position, and around the back of the layout have another bar, that pushes the handles back downwards again. Sort of like what you have for tipping, but the opposite direction. You could have a return contraption (almost identical to the first one but just high enough to catch the upturned wooden bar) just above the original bar that forced them back down again. Effectively it would create a channel for the wooden bars to run in. I hope all my writing makes some sense (I rarely do ) I will endeavour to draw a diagram and scan it in. Excellent! The rust is very believable. I like the idea of the female loco operator too. 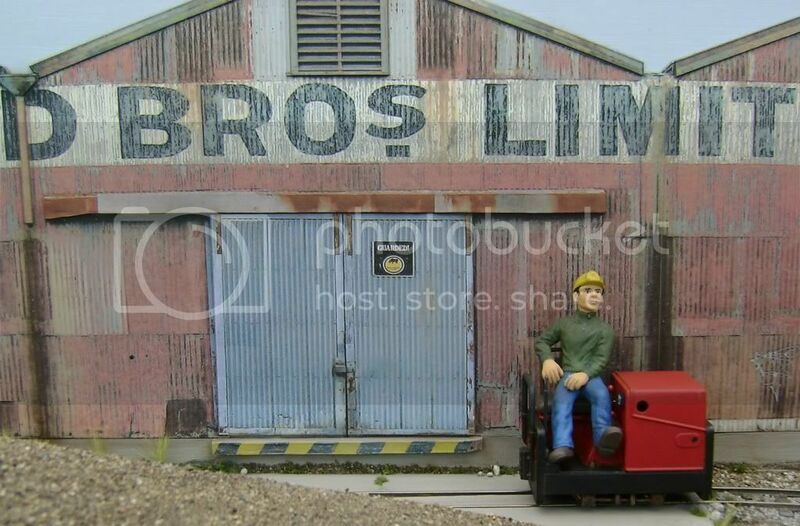 Some years ago I made up something similar in S gauge using flat bed tilting log cars. At the time old American Flyer cars of the type were hard to find, so I had to build my own. An arm came out from the bottom of the car that rode up a ramp at trackside, similar to your device. This tilted the bed of the car to dump the logs. To bring the car bed back down, I weighted the side that was up with a tiny bit of lead to make it drop back down. That way I didn't need to build another tipping ramp. The tough part was calculating the point just short of vertical so that the bed would go back down with just the weight. Fully automatic, yet very simple. Once I got it working, it was really neat to watch in action. 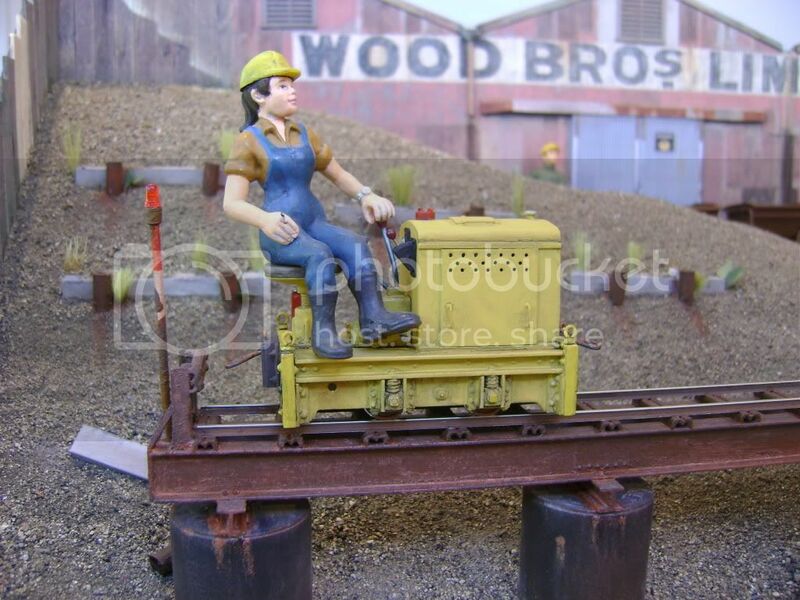 They had much shorter 'rods' on the wagons and the unloader had a short ramp that flipped the wagons back again. Unfortunatly I don't have the versions that I had many years ago but a google search might find some photos to explain what I mean. Many thanks for the comments and suggestions, chaps. It's gratifying that my cunning plan to tip the skip works in practice, but the matching plan to get it back down isn't a practical proposition. 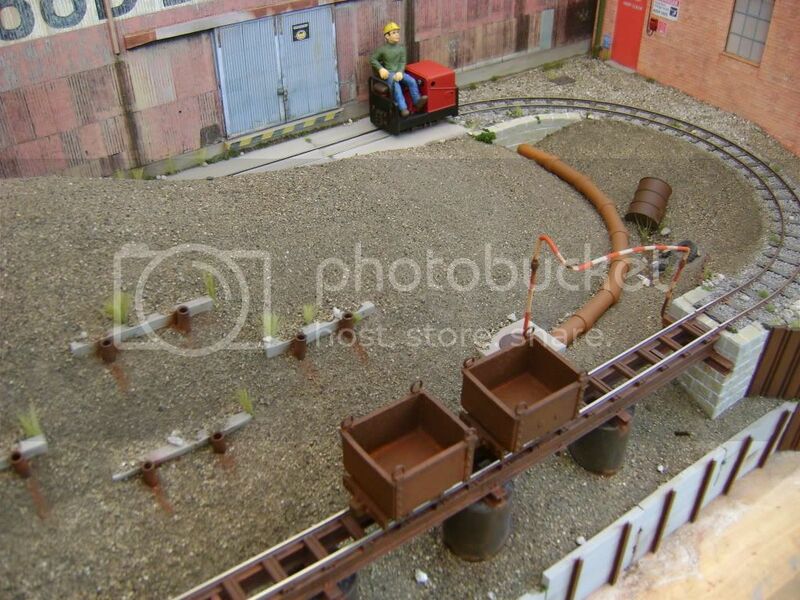 I had intended to have a wire overhead, angled across the track, which the long arm would catch on the way back from the tipping dock, and so bring the skip down again. The major obstacle to this was the driver's head! The original idea was for the loco to pull the skips onto the dock in reverse, but Didi clouted her head on the tipping frame, so I now have the loco pushing the skips, facing forward, so she is far enough over from the frame to miss it. The planned wire will foul her head again, unless I make the tipping arm much longer, and it's long enough now! So, any scheme that uses something overhead, or encroaches into the footprint of the loco, runs up against this problem. 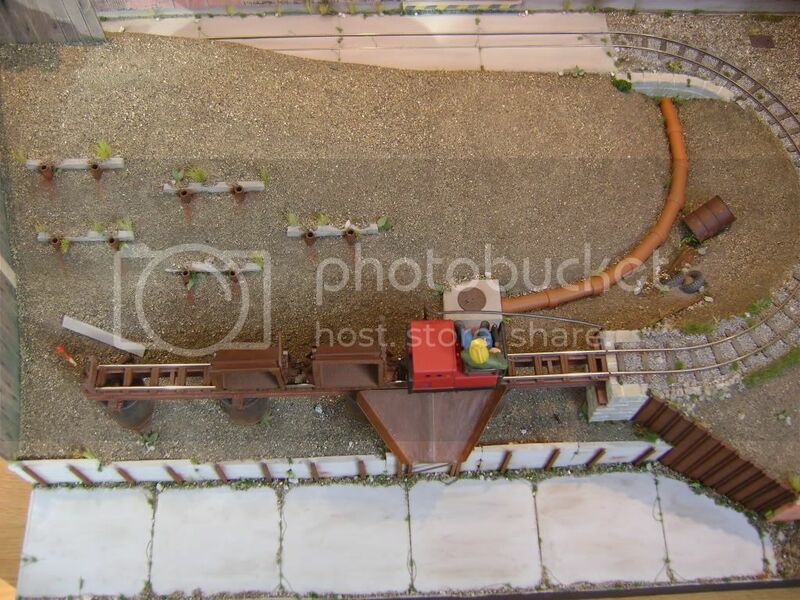 I have this mad idea of burying a length of tube in the scenery, surfacing alongside the track just off the tipping dock on the opposite side to the frame, and pointing upwards and across the track. On the other end of the tube have a rubber squeeze bulb, and blow a short blast of air into the upturned skip, pushing it over, as it goes past. Needs a bit of coordination, but early tests using the Big Bad Wolf's technique are encouraging. 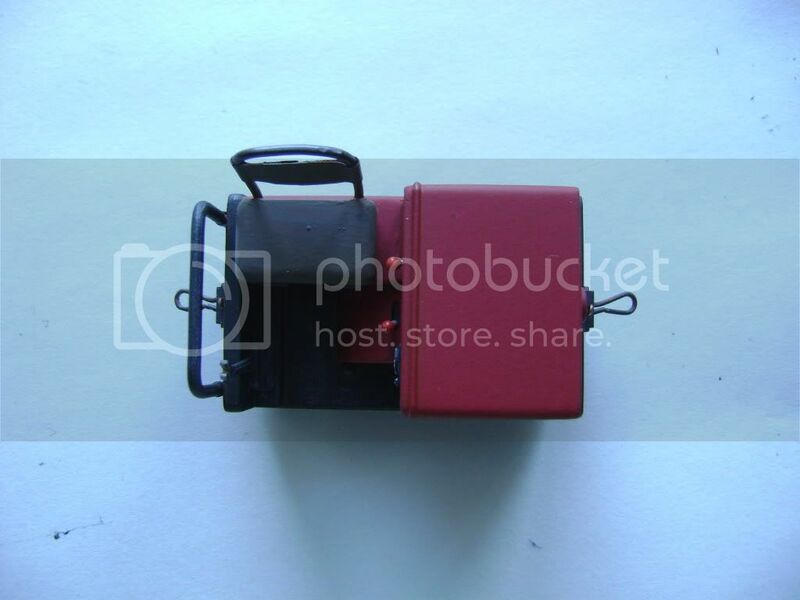 Would this be a pneumatic device? On the other hand, I could just run the skips off scene in the tipped position, and push them back down with the Big Hand In The Sky. I confess that I am like a terrier - give me a challenge and I will keep at it until I think I have a solution. 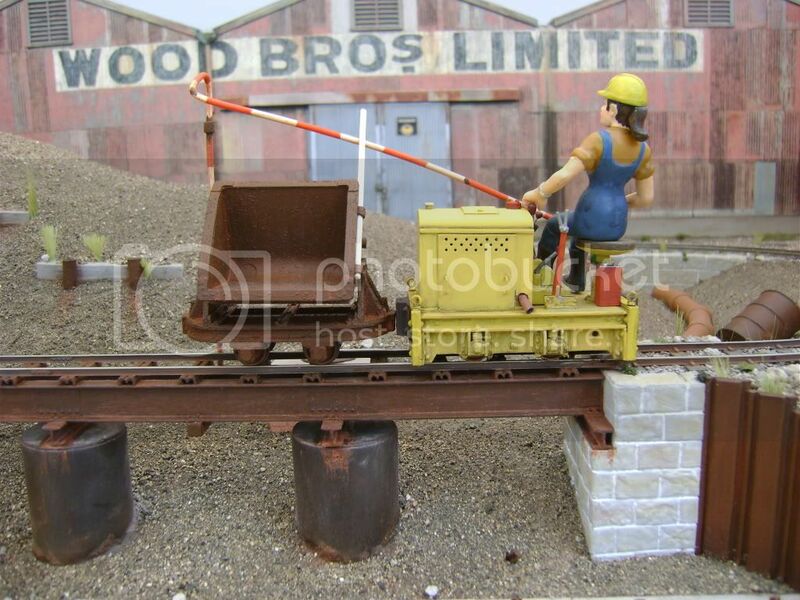 If you think it worth it you could always make the wooden arms shaped with a s shaped curve so that when the skips are in the tipping position the arms are not so high and so the tipping rail can be lower and further out. Again it would be easier to draw than I have taken to describe. Barry, I think I see where you are coming from - have an arm that rotates over the track after Didi is safely out of the way, and engages the arm to push it over. Yes, a good alternative scheme. Simon, I can see what you mean about the tipping frame not needing to be so far over the track to tip the wagon, though I think it would still have to intrude a little way. Didi sits well over, as you can see from the 3rd photo above. It would need any device on the lines that Barry suggests to tip the skip back to have a longer arm, I think. Fascinating to see how people approach this problem! 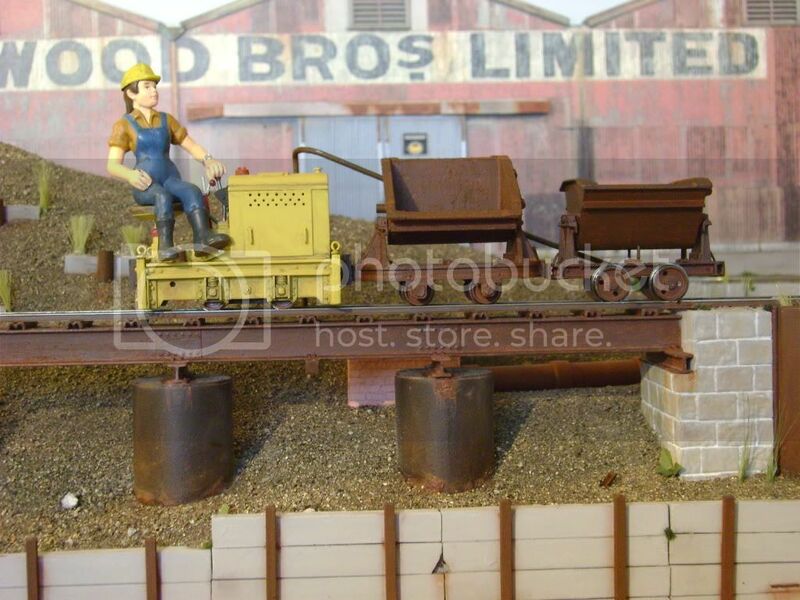 at the photo of the Fleischmann dumper shed. Opposite the sign is a low-level ramp that catches the lower edge of the tipped bucket as the wagons are reversed out after tipping. 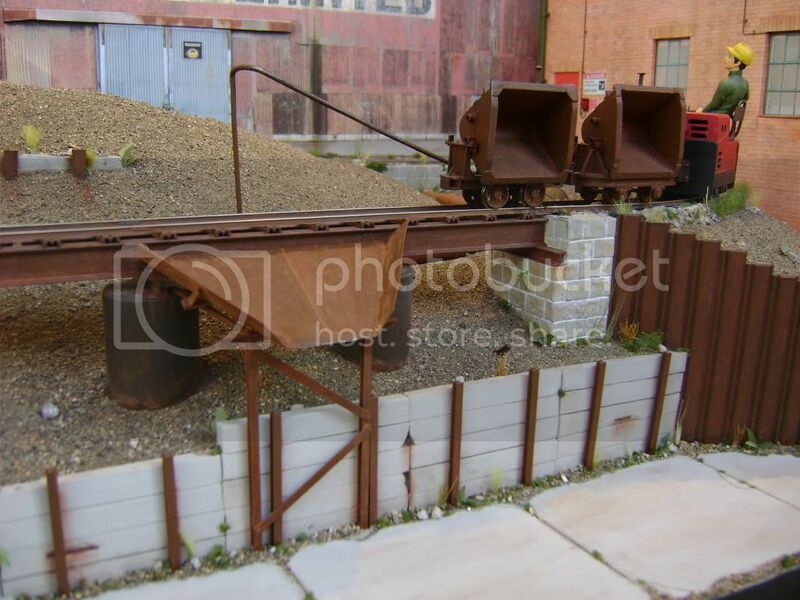 This ramp gives the tipped bucket on the wagon a "gnudge" back to the loading position. Note that this ramp is lower than the height of the top of the V-tip and well clear of the track. 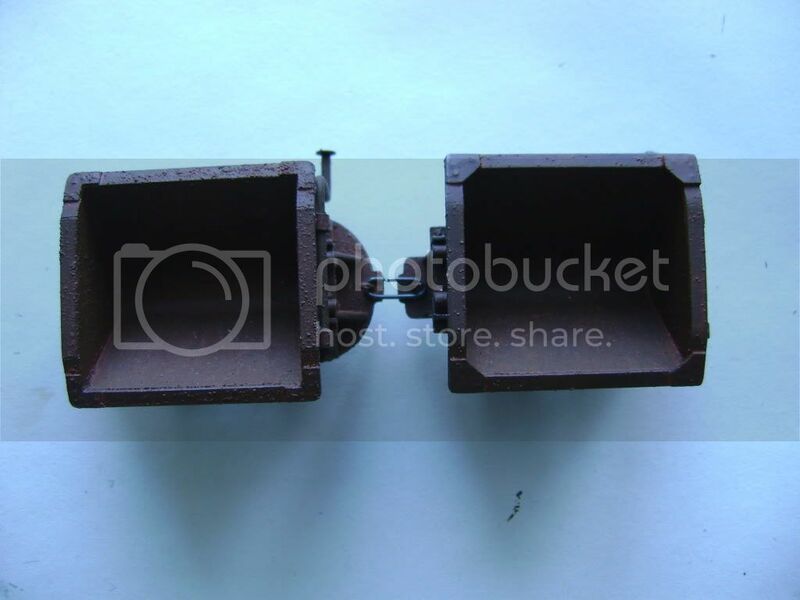 Once the V-tip bucket gets off it tipped position it will usually self-level in the loading position. 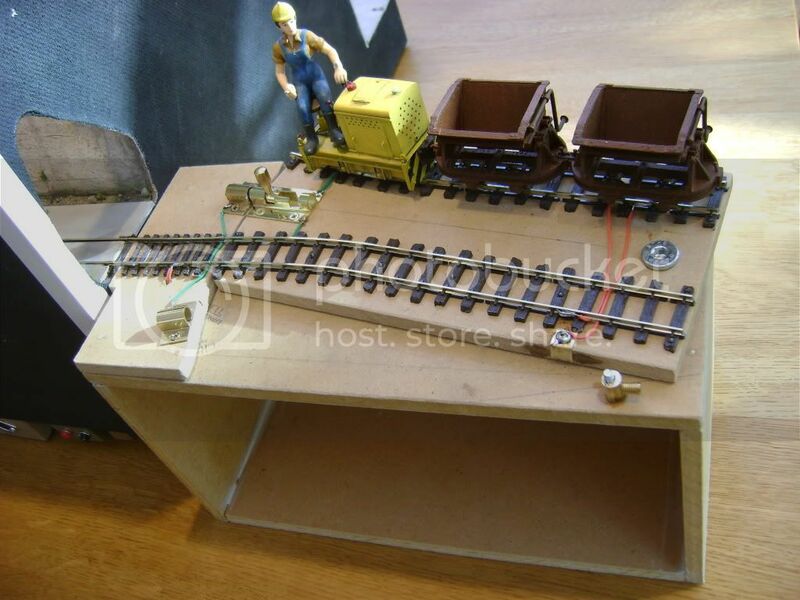 Another idea, which you probably will not think much off, is to use DCC then you can motorize each of the wagons with one of those phone shaker motors and tip and return them anywhere you want on the layout. However I must admit it is a bit (very BIG bit) of an overkill unless you already have the DCC equipment. 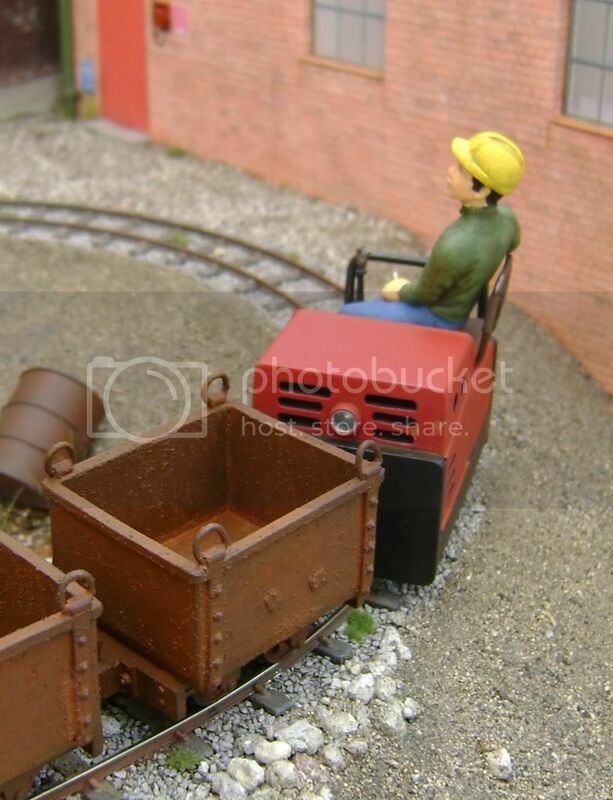 Have a look at the June & July Mid-Month editions of the Micro Layout Website at www.carendt.com to see how I've achieved dumping/returning of the V-Dump Cars on the 'Sylvester Chocolate Mine' Layout. The layout is looking superb! It just goes to show that you don't need a multitude of pointwork or to spend a fortune on scenic materials and buildings to get a good effect. As for righting the skips after tipping, how about a twist of wire around the handles, then a magnet to attract them back down. Would probably only need to start the movement, gravity should do the rest. Well Chaps, many thanks for all the suggestions - what passes for my brain has been mulling them over and has finally come up with something. Simon, I was rather dismissive of your S-shaped idea, but what I have now tested is very similar - the L -shape! A few months ago a little art shop in my local town closed down, and sold it's stock off cheaply. I bought some big bottles of Liquitex Concentrated Artists Color acrylics in burnt umber and cadmium orange (great for making my rust, with the magic ingredient) neutral grey and cadmium red, some self-adhesive lead strip, used for making faux-stained glass (and great for fast fixing of extra weight on wagons), and some aluminium wire. This last item comes in a big roll and is 2mm diameter. It's easy to bend to the shape you want, and is exactly the right size to fit in the tipping arm fixings put on the ends of my wagons. I bent up an experimental L-shape and re-used the old tipping gantry to try it out - and it works perfectly, doesn't stick out so far, and the gantry doesn't foul any part of Didi's anatomy! The prototype L-shape tipper arm in place. The next step is to install a new tipping gantry, made from the alu wire, and 3 more L-shapes. As for getting the tipper bodies down again, I am trying your magnetic method, Steve. 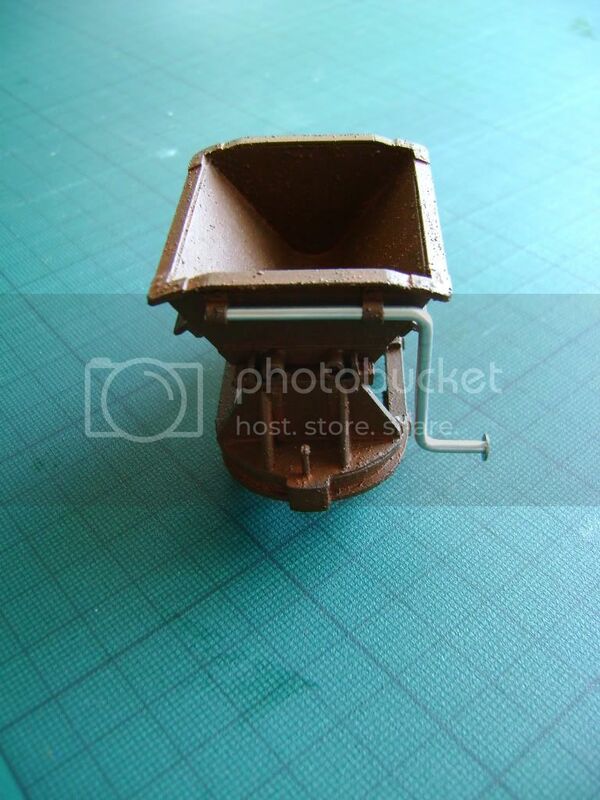 You may just be able to make out a little washer on the end of the tipper arm. This is made of steel, and I'm experimenting with various magnets to get it to pull down on the tipping arm and so right the body. I may need a more powerful magnet, or a bigger washer, but the concept is good. The Fleischmann tipping device has a small 'ramp' on opposite side to give tippers a nudge back to normal. Maybe something on near side of track just as wagons leave tipping area to nudge tipper back. Well, a good result today. The new skip works well with the tipping frame, and seems to run around the track with no problems. Old and new skips on the tipping dock under the guidance of Didi. The sharp-eyed amongst you will have deduced that this is a posed shot - no coupling links between the stock. However, they push around the curve and through the tipper with no problem, so links is the next thing on the list. The big event today was to plug in my Gaugemaster Hand-Held controller for the first time. I tried it out first with Wot the Deutz - and the brand-new Spud under it ran perfectly. Slow running is a revelation - it crawls around like an arthritic snail, with no hesitation at all. Then I tried Ernieplex - same result - smooth, ultra-slow running. Finally I tried Gnot a Gnat, with the rather coggy BEC mechanism - again, nice smooth slow running. My poor old Clipper, bought at the 009 second-hand stall at Pewsey 2 years ago, is now only good to provide the 16vAC supply, as it goes instantly from immobile to rather too fast and can't achieve smooth running to save it's life (although the UE mechanism did better than the others). I have bought some small disk rare-earth magnets from the local Maplins, so the next task is to work out how use them to coax the tipper bodies back to the horizontal. So, fabjulous day, calloo callay. Right - coupling links have been sorted. I have a bundle of black-finished florists wire which is easy to bend and isn't shiny without the need to paint it. For the locos with the small coupling pockets - Wot the Deutz and Ernieplex - I developed a waisted loop - like an asymmetric figure 8 - which allows the coupling to swing sideways enough not to drag the coupled-up wagon off the track on a curve. Gnot-a-Gnat has the wider coupling pockets so can take a simple loop. The loops are held in place with the shanks of No 10 fish hooks - I think I have you to thank for that tip, Steve! The wagons are coupled with simple loops, long enough to cope with the swing on the curves, but not so long that they get in the way when pushing the stock. I expect the rest of you have sorted this little matter out long ago, but it's one of those things I've been putting off for a long time. Now to get working on those rare-earth magnets! Bilco wrote: The loops are held in place with the shanks of No 10 fish hooks - I think I have you to thank for that tip, Steve! I'm continually astonished at the speed with which people here construct locos and complete scenery - and all with fantastic results! I seem to have been pottering about, planting a bit of vegetation here, a few boulders there, and sticking down the odd bit of painted card for a bit of variety, for weeks and weeks. There are finally some signs of progress visible, especially at the front of the layout, to show for the weeks of slow motion modelling. A view of almost all the layout, showing the road and the tipping chute - now I just need something to tip whatever it is into. 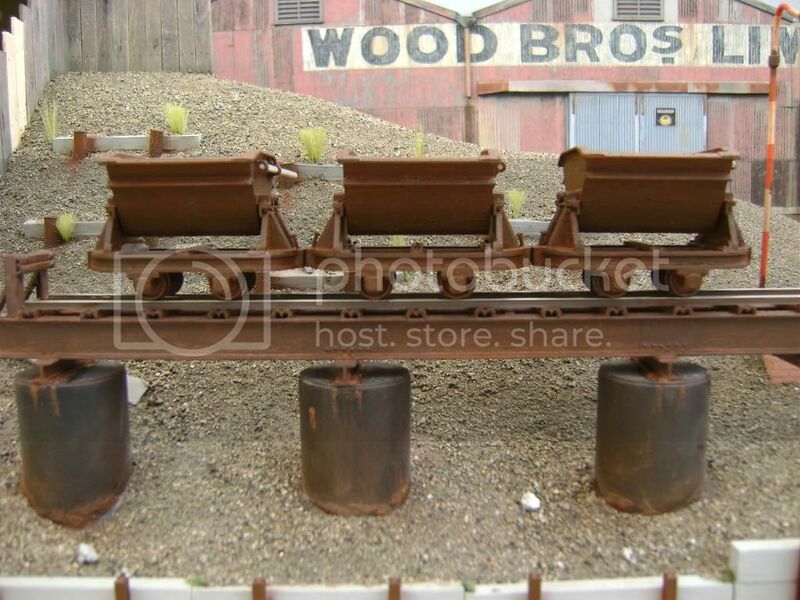 A closer view of the tipping chute, with Woody and Ernieplex plus a couple of tippers. Didi and Wot the Deutz at the end of the tipper dock - studiously ignoring the warning light Health and Safety insisted should be fitted. Still lots to do, so I'd better get a shift on!